So, here it is. Michael's big day. My big day. Our big day. Michael, my husband, is going to spend two weeks with me as my passenger. Finally, finally, he is going to see what it's like to be a truck driver. Bobtailed, I took the tractor home—legally; I had permission—for loading. We had cleaned the little throw rug and my laundry, and put them in their places. The rug goes right in front of the bunk so I don't have to step on cold rubber when getting out of bed. My clothes go on the two shelves to the right of the bunk, above the alcove where most drivers keep their TVs and I keep my computer. A few things get hung from hangers below the alcove. Michael's clothing was carefully packed into a large gym bag. I lowered the upper bunk and put a fitted sheet on it, then placed Michael's gym bag at the foot of it. We added the comforter from our bed at home and Michael's favorite pillow. "Can't I sleep with you?" he asked. It sounded sweet, but I knew he mostly didn't want to climb into the upper bunk. And I sure as hell wasn't going to. "We can try," I promised. "But, let's face it. We are not small guys, and the lower bunk uses a single-sized mattress." I then showed him how to get into the upper bunk, which isn't really difficult. The cabinets in the truck are made to double as steps. It's much easier than climbing a sheer cliff wall. We'd been waiting for an assignment to arrive; and one did while we were packing. It was a load from Reckitt Benckiser, just down the street from us, going to Oregon. That was over a thousand miles, which was good. On the other hand, it couldn't be picked up before 6 pm, which was a pretty slow start for a week that was beginning on Tuesday. I wouldn't be getting a whole lot of miles this week. But, what else was new? We took advantage of the extra time by taking the tractor to our neighborhood Wal-Mart Super Center. Our purpose was to buy canned goods to last us for the next two weeks, and fresh fruit to last at least a couple of days. We got the usual: Chef Boy R Dee, Chunky Soups, and the like. Michael bought some tuna, which I don't eat. I got some Pop Tarts, which he doesn't eat. And we got a bag of navel oranges. However, in terms of volume, our largest purchase was junk food. (I'm not counting the Pop Tarts. Pop Tarts are part of a nutritious breakfast, according to the package.) We bought Cheetoes, Fritos, cookies, crackers, and a big block of Monterey Jack cheese. As we were leaving, I nodded at the cheese. "We don't have a refrigerator," I reminded Michael. "That cheese won't last more than a day or so." Michael looked at me as if I had two heads. "Well, of course it won't," he laughed. Finally, we were ready. We kissed my Mom goodbye, and promised we would call every day and would celebrate Mother's Day when we returned. We hugged the dogs, and Celeste, our friend who is renting a room in the house and who had agreed to feed the dogs while we were gone. We had already said goodbye to my daughters, ex-wife, and grandson Zachary the day before. So, we were ready. I started the engine, shifted gears, and we headed out onto the highway. Ten miles later, we had arrived at Reckitt Benckiser. I'd been there many times before, so locating and picking up our load was no problem. Then, we were off, heading into the setting sun. I had started the laptop playing music through the radio. Michael and I had stopped by the Public Library the day before, and had over a dozen books on tape but we decided to listen to them later. We had a lot to talk about. After all, we hadn't had much time for conversation in the previous ten months. The reason for Michael's traveling with me now, and not sooner or later, is that he had been making arrangements to go back to school. His classes towards a degree in Exercise Therapy would begin on May 19th. So, this was our last possible fortnight to go. It took us the usual six hours to get to Fontana; and, by then, I was bushed. Schneider likes to think that, because we haven't been driving for ten hours, we've spent the previous non-driving time in some sort of restful trance. But I'd been alert, waiting for the assignment to come in; and then, when it did, we had to leave immediately. Ideally, I could have kept driving my legal ten hours—but I couldn't. By the time we got to Fontana, around 3 am, my eyes wouldn't stay focused on the road. So I pulled into the Operating Center yard, backed into a parking slot, and pulled the curtains shut. The truck has bunk beds. The lower bunk is a standard, single-sized mattress. The upper bunk is a little narrower. We had made the upper bunk so that Michael could sleep in it, and I had shown him how to climb into it safely. However, he wanted to try sharing the single bed with me and, frankly, so did I. So I got in first, which would put me to his right, the way we usually sleep at home. Michael got in next, and we held each other and kissed. It was wonderful to have my lover sleeping with me. I knew he felt the same way. And then, exhausted by the drive, I abruptly fell asleep. We awoke at eleven in the morning. Michael was affectionate, but I regretfully explained that we had to get going right away. We used the Operating Center bathroom and got breakfast-to-go from the cafeteria, then cranked up the truck and continued on our way. I had not gotten enough sleep and was still tired. We drove and talked our way up California's I-5. Michael was impressed with the beauty of it, especially the Grapevine; and unimpressed with how I managed to keep the many-ton truck under control on the steep grade. Apparently I made it look too easy. We stopped briefly at the TA truckstop at Wheeler Ridge, and finally shut down for the night at the TA in Corning. We had covered 669 miles that day, a good driving day, but I was exhausted. I couldn't get my contact lenses out fast enough; they had been irritating my eyes for the previous two hours. Again, Michael tried to woo me; again, I was asleep almost before he had gotten into the bunk with me. Driving is tough, tiring work. My cell phone, which doubles as an alarm clock, went off at seven and we were off soon after, having taken time for a brief pre-trip inspection. By two o'clock we had made it to the Portland area, our first stop. This was a two-stop load; the second was on the other side of the state, but we couldn't start driving there until the folks at stop one had unloaded their part of the cargo. While they did so, I rested and Michael did some writing. Michael has relatives in the Portland area, several nieces and nephews. We'd have loved to visit them, but since we were only going to be in the vicinity for a couple of hours, there didn't seem to be any point even in advising them we were there. If we'd known the unloading would take almost five hours, we would have called. But we didn't. And, immediately afterward, we started the truck and headed eastward. The final stop was a simple drop of the trailer at the Hermiston, Oregon Wal-Mart distribution center, three hours away, which took no time at all, after we got there. We then had to decide where to sleep. There was a Pilot truck stop not far away. But Michael wanted very much to stop at a Wal-Mart SuperCenter for more groceries and snacks. He had thought we were going to drop the trailer at one, not knowing that a distribution center is not a retail store at all. So, I asked the guards at the distribution center if there was a SuperCenter nearby; there was, about four miles away, and we proceeded there, bobtailed, and parked in their lot. We then went in and spent an hour shopping. Michael loves to shop. He does it for pleasure, even when he doesn't intend to buy a thing. I was, on the other hand, again, exhausted. It had been another ten hour day in which we had covered 670 miles—ten-and-a-half hours, if you include the pre-trip inspection in the morning. Michael was able to nap when he wanted to and sometimes nodded in the passenger seat even when he wasn't in the bunk. I know he had been expecting this trip to be a second honeymoon. I wanted, very much, to be with him as well as having him along for the trip. But the load came first. I couldn't see straight. The time spent shopping in Wal-Mart was agony. I kept yawning and couldn't make even the simplest decisions, such as which brand of corn chips to buy. When we got back to the truck, I knew we would be staying there overnight. The truck was shut down, because I was about to shut down. The good news was that we had completed that first assignment, and wouldn't be getting another one until morning. My eight-hour DOT break would be over at 6:00 am, but I told my dispatcher not to give me an assignment until 8:00. That would, at least, give us a couple more hours to sleep. We were awakened in the morning by the beep of the Qualcomm receiving a message. It was our next work assignment. It was a load to be picked up at the Wal-Mart we had just left, to be taken to the Operating Center in Fontana, California for relay. The good news was that we could pick it up any time today, and there was no great rush getting it to Fontana. 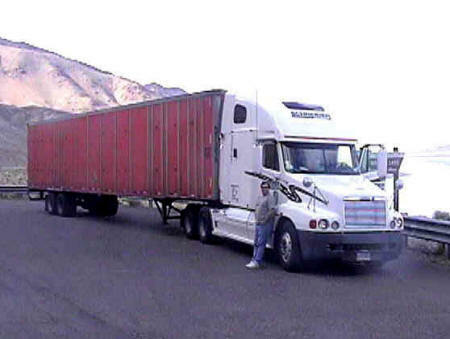 Now, normally a truck driver is going to get going as soon as possible, to maximize the number of miles he or she drives. More miles means more dollars. On the other hand, I'd driven so many miles this week, I was potentially going to run out before long—remember, we can only work a maximum of seventy hours in seven days. So, I decided we could sleep in. Hermiston was cool, even with the sun out, and we were comfortable in the truck. In fact, Michael had barely stirred when the message came in; I had to climb over him to answer and still he only shifted position slightly, lazily, stretching afterward. "Do we have to go right away?" he sighed. "No," I replied. "We're good for a couple more hours." "Good," he said. I started to turn over to go back to sleep, but he wrapped his powerful arms around me and gave hugged me tightly. "I've missed you." "You've been right here," I said but I knew what he meant. How ironic that, with a job that keeps me away from home so much, now that we were together in the truck I had been too exhausted for the physical relationship we both craved. But that was then, and this was now. We'd both slept, and could sleep more, and there was no pressing assignment to take precedence. We kissed deeply, and immediately reached for the pack of Doublemint gum on the console next to the bunk. Morning breath! But then, moments later, even while still chewing the gum, we kissed again and melted into each other's arms. And for once, there was no rush and I wasn't exhausted.